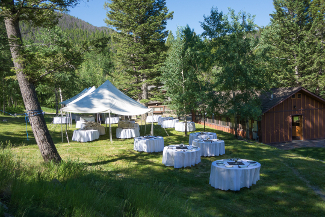 Surrounded by the Continental Divide’s stately peaks, the Feathered Pipe Ranch is the perfect special events venue for your destination wedding, family reunion, or other special occasion. Set amidst wildflowers and natural gardens the hand-crafted timbered Lodge stands above a huge lawn, which slopes gently down to a sparkling lake. The waters reflect the clear blue sky, the quaking aspens and the forested slopes of the mountain heights. The lawn at the lakeside is a favorite wedding site, whether for a large or an intimate gathering. The spacious Lodge, with its high rafters, balcony and great fireplace, easily accommodates an indoor ceremony. The main room provides dining space for 80 guests, and its shining wood floor a wonderful place to dance the night away. Rustic chairs and tables are distributed in casual groupings on the lawn for a relaxed and comfortable mingling in the glorious mountain air. For more than forty years the Feathered Pipe Ranch kitchen has been justly renowned for its natural gourmet cuisine, perfectly prepared and presented. 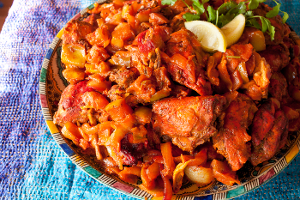 See our recommended menus for a buffet-style feast, or arrange to have the meal served at table. Our chef can supply a scrumptious and beautiful wedding cake to your order, or you can provide your own. You may wish to hold your rehearsal dinner here as well—we will be glad to help you plan your menu. 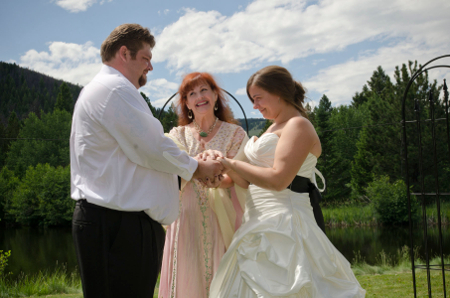 You may find it convenient to have your wedding party and special guests stay in our comfortable lodge, cabins, yurts. deluxe wall tents or tipis. You and your guests will enjoy the natural beauty of the grounds, with its lake for swimming (try the rope swing! ), boating or fishing, and its many trails for hiking or horseback riding. The Bathhouse has a commodious sauna, a hot tub and massage room for relaxing at the end of the day. A fire on the hearth or a campfire under the stars will carry the magic into the night. Take a virtual tour of the Ranch. 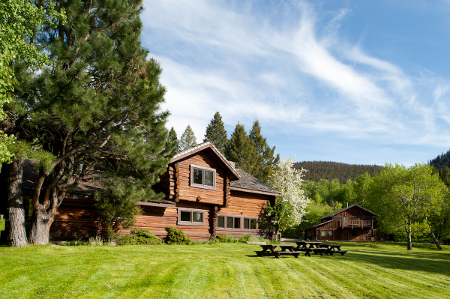 For more than four decades the Feathered Pipe Ranch has been host to the premier yoga, health and wellness retreats in North America. For those who have enjoyed its peaceful beauty, its pure air and water, its comfortable facilities and friendly staff, it has become a favorite gathering place for special events. Starting with the weddings of family and friends, the ranch has now become known as one of the finest wedding venues in the area. Situated just twenty miles from historic Helena, it is within easy reach of all urban convenience, while dwelling serenely in a world apart. 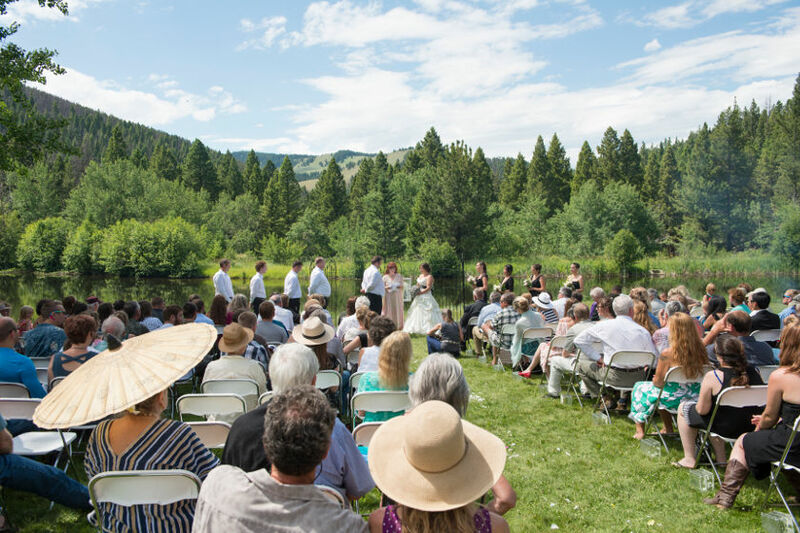 With daily connection to and from Minneapolis, Seattle, Salt Lake City and Denver, Helena Regional Airport, located just thirty minutes away (and with shuttle service available), we are the ideal location for your dream destination wedding or large family reunion. Our experienced staff is ready to help you plan your event — be it large and formal, or intimate and relaxed — and to be on hand to make sure all of your arrangements go smoothly from first to last. For more information and to reserve our mountain paradise for your special day, Contact us at info@featheredpipe.com or call (406) 459-6831.